The Yala National Park is the most popular among tourists and therefore most visited national park in Sri Lanka. This is mainly due to the large number of animals that can be observed here. Besides crocodiles, elephants, mongoose and many monkeys Yala has the world to offer one of the densest populations of Leopard. The park, however, has not only to provide a highly versatile fauna. 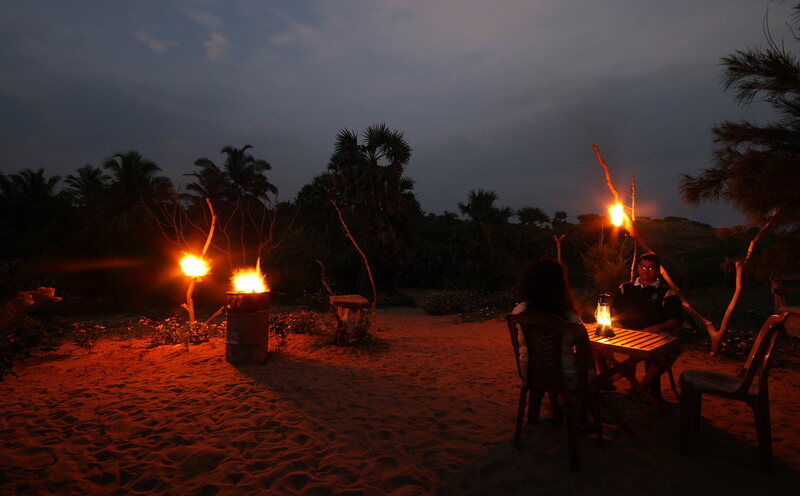 Also scenic Yala is a feast for the eyes with dunes, lagoons and coastal, trees and bushes, rocks, plains and water holes. The Yala National Park is located in the south of the country. The entrance is located about 20 km southeast of Tissamaharama (Tissa called short). 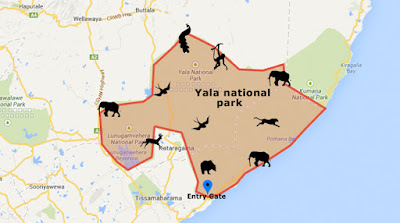 Called Yala, or Ruhunu or Yala West National Park, covers an area of ​​1,260 square kilometers. The largest part of this area, however, about 4/5 of the country is considered as a nature reserve, which is inaccessible to visitors and tourists. Yala is in a hot, semi-arid environment despite its lush greenish look, especially during the monsoon season. Temperature ranges from 260C to about 300C. The North-east monsoon season is when Yala gets most of its rainfall from September to December. What can be seen on a safari through the Yala National Park? Before one decides to visit the park, you should keep in mind two things: The ride through the national park can perhaps be a little disappointing if you expect, leopards and crocodiles as well as herds of elephants at every waterhole and monkeys hanging from every tree to be seen. Sometimes you drive around for hours and for example, has still not seen any elephants or leopards in the wild at the end of the day. Did you see the happiness, some animals at close range, it may happen that at once a kind of mass casserole to the animal forms and gathered a number of jeeps with fotowütigen tourists to the animal. This, too, should know before visiting Yala. Taking into account these two aspects, you will not be disappointed by a visit to the Yala National Park. in Yala are possible. However, one should note that the accommodation offered are priced rather high-class. Offered six bungalows with drinking water but no electricity. Reservations can be made via the "Department of Wildlife Conservation". Alternatively, spend the night on one of two rather simplistic held campsites in Yala. Equipment and supplies are brought along. Reservations for the campground accepts the Park Office. Today, of about 140 km2 in extent, is open for public viewing from 05:30 am to 06:30 pm after which you have to vacate the park, unless you have opted to stay in one of the camp sites or bungalows inside the park. The ideal time to explore this vast nature reserve would be during the break of dawn and the fall of dusk. Is for the more adventurous as it involves several river crossings and a four wheel drive vehicle with all terrain driving capabilities to venture deep inside the wilderness, but you’ll also need backup vehicle to venture into Yala Block II, where you’ll encounter less disturbed wildlife but are very shy of noises and will beat a hasty retreat into the shades. If you come from north then take a direct bus to Tangalle, Matara, Galle, etc, and hop off at a Tissa-Punnegamuwa-Junction Stop. Then you have to take a tuk tuk (150-300LKR) for ca. 4km to Tissa. From Tissa leaves many buses to Matara - I assume from the south you can drive to Tissa directly. Yala National Park can be reached coming from the hill country via Wellawaya to the south coast, or from Colombo along the south coast past Galle. Yala can also be accessed from Tissamaharama and Kataragama. Useful drive times include: Galle to Yala (3.5 hours); Colombo to Yala (7 hours); Dickoya to Yala (5 hours); Bandarawela to Yala (3 hours). Best time of year to visit: Year around park – November to January can be rainy period. The park is usually closed from September 01 to 15 October yearly but this is subject to change. Make a well thought-out schedule. If you are a local planning your first trip to Yala, plan you route and make sure you have proper transport. While a 4-WD vehicle is recommended a van with high ground clearance would do. If you don’t have one, you can hire a safari jeep at the entrance. If you are an overseas visitor, Yala would be among many other local destinations you plan to visit. So, it is important to slot it in well. Talk to your tour operator about travel time from your previous destination and where you need to be after Yala. You might want to get into the general area the previous evening, so that you’ll be nice and relax entering the park. If you are travelling by car, you’ll need to hire a safari jeep at the gate. Your park ticket includes a trekker but remember, there is a shortage of trekkers as more and more visitors flock to Yala. You might want to pre-book your safari jeep, ticket and trekker. You can purchase your ticket on-line here and you can pre-book your jeep with trekker here. Trekkers give of their best when they know that you will tip them generously. Rs.500 would be par for the course. Sri Lankan leopards (Panthera Pardus Kotiya) are said to be a distinct sub-species from their Indian neighbors. Leopards can be seen throughout the park, though best period for enjoying the sights of leopards is during January to July. Imagine, you are a superstar and you don’t even know about it. And zillion people come at dawn and dusk, just the same way the paparazzi zoom in on their target. They hustle and jostle for vantage points, follow you round like a bunch of possessed men or a pack of looting hyenas. They won’t even let you eat in peace or let you enjoy that well-earned fiesta. If this happens to you, surely you can call in the Police or hire some security guards. You’d give a piece of your mind, at least. A leopard can’t call in the Police but it can give you a piece of its mind but it chooses not to; displaying greater tolerance and latitude that humans show. It has little option but to accept and adjust, letting you enjoy that perfect shot while our irresponsible actions may forever change even their gene pools, as they learn to live with noisy human visitors. There are some 40 leopards, the highest gathering in the world, putting up with you. A gracious host only asks for a considerate visitor. Nearby Lunugamvehera National Park serves as a corridor between Yala and Uda Walwe National Park. Yala is home to considerable population of elephants which varies seasonally. Dry season of May to August is the best period to see elephants. Yala National Park is rich in birdlife and around 130 species have been recorded.Raptors include crested serpent eagle and white bellied sea eagle. Among the water birds attracted to the lagoons are Lesser Flamingo, Pelicon, Spoonbill, painted stork, rare black necked Stork, grey heron, purple heron, night heron and Darter. When you enter a national wildlife park you accept the risks involved. While animal attacks are rare, you must remember that they can happen. Animals are highly unpredictable, temperamental and may easily be provoked or spring to action without a warning. They are known to guard their herds and territories; with behavior different from one species to another. Elephants offer the highest risk while other predators may pose dangers at close range. In case of an emergency, remind yourself to be calm and intently listen to the instructions of your trekker. If you are on your own, remain quiet, engine of vehicle cut and do not leave the vehicle at all. In extremely dangerous situations, your trekker may ask you to put foot to the pedal; remember to keep calm and think rationally. Loud noise should be made only if trekker says so or when no other solution is in the offing, in the face of a violent, persistent attack, which is extremely remote and unlikely. Your trekker is trained for any eventuality and will take you out of harm’s way. If you do not have a trekker, call for help if you need assistance if you are lost or need urgent help. Guns, knives, and other potential weapons as well as matches, lighters, drugs, cigarettes, alcohol and anything that can harm the nature are strictly prohibited. Having illegal items in your vehicle or in your person can land you in jail. Do not feed animals and remember, there is a red light also for your own food! Smell of food can interfere with animal habits and behavior. Have a good meal before entering the park. You can bring a snack but avoid cooked food and items with strong smells. You’re your food in airtight containers and consume at designated rest areas only. Cameras, video-camera, mobile phones and other electronic devices must be used with care. Put your phone to ‘silent’ and switch off your stereo as some animals can clearly hear low frequencies even at a reduced volume. Do not do flash photography. Do not ‘honk’ inside the park. Alcohol consumption is strictly prohibited within the park. Nothing, no nothing can be thrown out inside the park. Keep your bags carrying any food items tightly locked to prevent from animals taking away their own thrash. 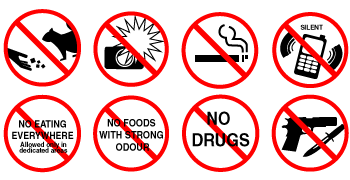 Carrying soil, stones, feathers or any other item from the park is strictly prohibited. Remaining in the park after dark is strictly prohibited. your trip to Yala revolves around the safari ride that takes you on an experience of a lifetime. Remember, this is no circus and animals are not on duty waiting for you. It’s that feeling of uncertainty and adventure that makes it a wildlife experience. To catch the inhabitants of the jungle you need to be there at the best time and thread patiently. The number of water birds inhabiting the wetlands of Yala is around 90, and roughly half of them are migrants. These include waterfowls (Lesser Whistling Duck, Garganey), Cormorants (Little Cormorant, Indian Cormorant), large waterbirds (Grey Heron, Black-headed Ibis, Eurasian Spoonbill, Asian Openbill, Painted Stork), medium-sized waders Tringa spp., and small waders Charadrius spp. Black-necked Stork and Lesser Adjutant are some of the rare birds that can be seen in the park. The migrant Great White Pelican and resident Spot-billed Pelican have also been sighted at Yala. Other water birds attracted to the Yala lagoons include Lesser Flamingo and pelicans, as well as rare species such as Purple Heron, Night herons, Egrets, Purple Swamphen and the Oriental Darter. Thousands of waterfowls migrate to the lagoons of Yala during the northeast monsoon. They are Northern Pintail, White-winged Tern, Eurasian Curlew, Whimbrel, Godwits, and Ruddy Turnstone. The visiting species mingle with residing Lesser Whistling Duck, Yellow-wattled Lapwing, Red-wattled Lapwing, and Great Stone-curlew. Rock Pigeon, Barred Buttonquail, Indian Peafowl, Black Stork, Black-winged Stilt, and Greater Flamingo are among the other bird species that call Yala their home. Crested Serpent-eagle and White-bellied Sea Eagle are the raptors of the park. The forest birds are Orange-breasted Green Pigeon, Hornbills, Old World flycatchers, Asian Paradise-flycatcher, Asian barbets, and Orioles. If you are not into bird watching, these magnificent flying machines invite you to study them, get to know them and be wowed by them. While most of the long coastal stretch that hugs the park is out of bounds for the human kind, the park lets you get off at designated places. It gives you a chance to exercise your legs and take a stroll on the golden sandy beaches. The primary beach spot open to public was the location for one of the bungalows which was wiped out by the Asian Tsunami along with its occupants. Remnants of the devastation and a memorial for the dead will offer you a profound moment of silence and solitude. A series of wildlife bungalows operated by the park afford nature enthusiasts to spend a night in the park. These bungalows are very basic, promote open space but give you an unforgettable experience as you experience a night in the animal kingdom. You can book a bungalow here. You can also be out on the beaten track before the rest of the traffic gets in. The name Sithulpauwwa is derived from the word 'Chittalapabbata' which means the hill of the quiet mind. The ancient rock temple is a place of worship for devotees. It is believed that in ancient times this rock temple housed a total of 12,000 monks. Located to the south of Sithulpauwa, Magul Maha Viharaya is believed to have provided the setting for the marriage of King KavanTissa to Vihara Maha Devi. One could combine a visit to Sithulpauwe and Magul MahaViharaya as they are located closely together. Wilpattu National park is among the oldest and most important of protected areas in Sri Lanka. It also contains a number of important cultural sites. The sanctuary stretches from the North-western coast to the North-central province where the ancient city of Anuradhapura is located. Wilpattu National Park is laced with a complex of lakes called ‘Villus’, surrounded by grassy plains, set within scrub jungle. 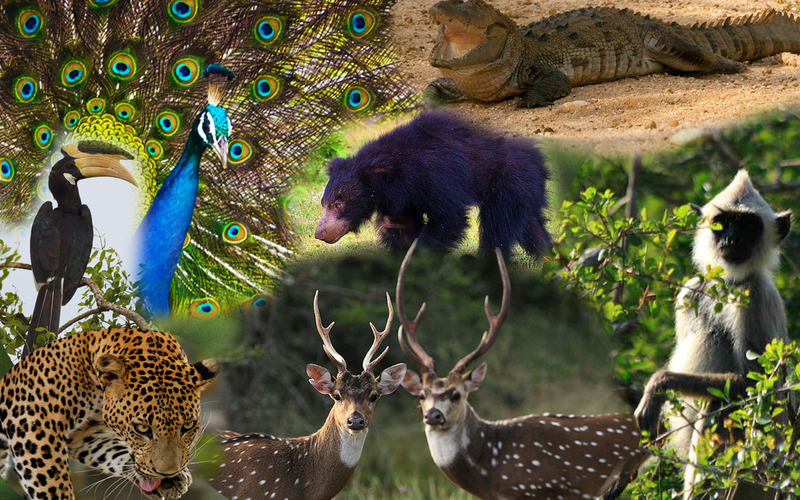 Many of the `big game’ found in Sri Lanka including elephant, sloth bear, water buffalo, and spotted dear can be seen here. Wilpattu is also known for leopards. Formerly known as Yala East National Park, Kumana lies on the south-east coast in the Eastern Province, 12km south of Arugam Bay, and is easily accessible from the Wellawaya-Pottuvil Road. The Park is physically separated from the more famous Yala National Park and Strict Reserve by the Kumbukkan Oya (River) and is better known for its migratory birds. A natural highlight of the park is a 200 hectare swamp lake sustained by the river through a half a mile long narrow channel. These mangrove swamps are a destination of choice for migratory birds. Among regular visitors who nest and breed are pelicans, painted storks, spoonbills, herons, egrets and little cormorants. Land animals found in the adjacent Yala are also found here. Wasgamuwa is home to a vast array of animals, as well as, ancient sites and tanks. Known for its rich population of predators among which bears receive significant attention. It is believed that Wasgamuwa has the highest density of bears than anywhere else in Sri Lanka. Bordered by the famous Mahaweli and the lesson known Amban river, Wasgamuwa spreads through the districts of Matale in the central hills and the ancient kingdom of Polonnaruwa. Gal Oya National Park, in close proximity to the eastern city of Amparai has an important task: to serve as the catchment area for Sri Lanka’s largest reservoir, the Senanayake Samudraya. It is the only national park where boat rides are allowed, offering visitors to the rare sight of swimming elephants, a phenomena famously known as ‘the crossings’. The Udawalawe National Park is Sri Lanka’s closest example of Africa’s savanna reserves. Better known as the country’s premier elephant park, Udawalawe revolves around the vast Udawalawe reservoir. Located on the base of hilly Ratnapura and Moneragala districts, the park is home, among other animals, to an elephant population of about 500. The park also boasts of an elephant transit home, with public displays during feeding times. The eastern park of Lahugala is among Sri Lanka’s smallest among parks but its importance to elephants and endemic birds is very big. Maduru Oya National Park is designed to protect the immediate catchments of five reservoirs developed under the Accelerated Mahaweli Development Program, Sri Lanka’s most ambitious irrigation project. The park provides refuge for wildlife and lies between the Polonnaruwa-Batticalo Road and Mahiyangana-Padiyathalawa Road in the districts of Ampara, Badulla and Polonnaruwa. Horton Plains, a world heritage site is the catchment area for almost all of Sri Lanka’s major rivers. A silent and cold highland plateau in the central hills of Sri Lanka, the beautiful Horton Plains is surrounded by peak wildernesses and forests and is home to many endemic plants and animals thriving in a rare wet and cold climate. The park offers spectacular hikes and culminates with the World’s End, a dramatic 900 meter cliff with nothing but flat land beyond extending to the coast of Sri Lanka’s deep South. Bundala National Park lies in the dry and arid Hambantota District in Southern Sri Lanka. But the park’s many lagoons make it a paradise for migratory as well as resident birds. Every species of water birds found in the country find a safe haven here. 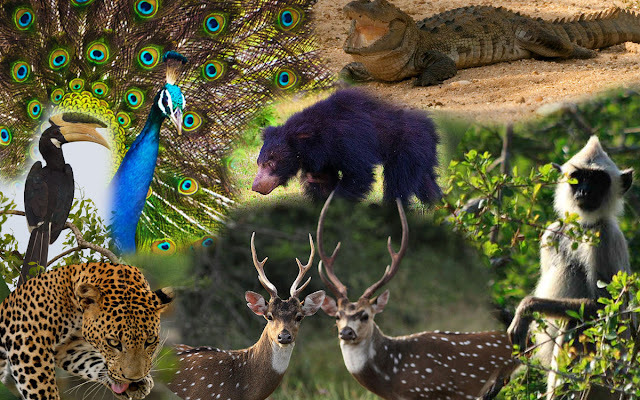 Visitors will also be treated to many land animals from elephant to the deer. Bundala is also said to be the only park where visitors can spot both the Marsh and Seawater crocodile on the same safari trip. Located adjacent to Yala National Park is Lunugamvehera Park, created primarily as a catchment area for the Lunugamvehera reservoir. A plan is mooted to amalgamate the park with its larger and more famous cousin Yala and if that happens, Lunugamvehera will be renamed as Yala West. Home for the world famous Elephant ‘Gathering’, Minneriya National Park is nestled on the plains of the North-Central province, about 20kms from historic Polonnaruwa. Fed by the beautiful Minneriya tank, the park despite being one of the smallest, is a haven for elephants and birds, providing magnificent views to visitors. 12- Kaudulla National ParkIn close proximity to Habarana, the gateway to Trincomalee and Polonnaruwa, Kaudulla revolves around an ancient tank and is considered as an important elephant corridor, offering regular sightings. One of the two marine parks in Sri Lanka, Hikkaduwa National Park in the popular southern coast features fringing coral reefs showcasing a bio-diversity spectacle. The 2nd marine park in the country, Pigeon Island is located in famed Nilaweli, on the outskirts of Trincomalee. The spectacular small island is home to a showcase of colorful corals and tropical fish and is a short boat ride from the world famous Nilaweli beach. Horagolla is biologically, the most diverse and significant patch of forest in the wet zone of Sri Lanka, located just outside Colombo. The park presents a special zonal vegetation complex which provides a natural refuge for many species that are extremely rare, possibly extinct, in other parts of the island. The only national park located within city limits, Galways is home to a montane eco system in the cold and windy hill station of Nuwara Eliya, also the highest located city in Sri Lanka. Galways is decorated by its beautiful population of birds, as well as, its colorful floral species of native and foreign origin. Along with the nearby Victoria Park, Galway is considered to be the most significant birding site in Sri Lanka. Believed to be the place where Ravana landed his mythical flying chariot, Ussangoda is situated in Nonagama, Hambantota in the deep South. Known for the red soil in the area, Ussangoda, with both land and sea features, is a haven for turtles. Originally a forest reserve within the Minneriya-Girithale Sanctuary within close proximity to Polonnaruwa, Angammedilla was established to protect the drainage basin of the giant Parakrama Samudra reservoir. The park is central to the integrity of the Mahaweli irrigation system, both for its unique “villus” and as a corridor for wildlife migration between grazing lands in Wasgamuwa and Somawathiya National Park. The area spans the Mahaweli River in Polonnaruwa district in North Central Province. Somawathiya National Park is one of the four national parks designated under the Mahaweli River Development project. Somawathiya Chaitya, a stupa said to be containing a relic of the tooth of the Buddha, is situated within the park.